This is what borscht might look like if it were a Mediterranean dish. 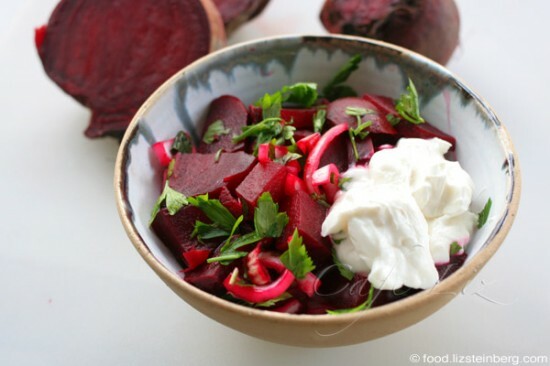 Instead of swimming in a bowl of hot broth, these bright red beets are marinating in lemon juice and topped with fresh parsley, with a bit of olive oil to add flavor. And the sour cream? Fresh labneh, or maybe yogurt. Beets aren’t especially cheap at the moment, but I had a craving (yes, it happens) and I managed to find a bunch being sold for half-off because they were ugly and misshapen. Well, once you cook them and chop them, you can’t tell. 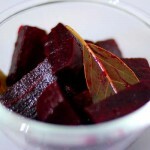 Cook the beets — either pierce them and microwave them in a covered glass dish until soft, about 15 minutes, or wrap in tinfoil and roast in the oven on high heat, also for 15-20 minutes. I used the microwave because I figured it was more efficient. Peel the beets — the peel should come off easily — and chop into chunks. Slice the onion, and toss with the beets along with the lemon juice, salt, parsley and olive oil. Serve alongside healthy scoops of labneh or yogurt. 5 Responses to "Beet salad with labneh"
funny you mentioned that, the organic farmer I buy from has not had them lately. Somehow I didn’t realize they are “seasonal” and I thought they were grown/sold here all year round I guess I was wrong. Gonna save this post until I have beets again. I know it isn’t even Purim yet, but I am going to have some guests for Passover this year, and they are vegetarian. So I’m searching for some recipes. Do you have any ideas as to what I can serve them? Yes, they do eat fish, but they do not eat eggs. Also, we do have a kosher home, so anything dairy won’t work, as we do eat meat on the holidays. Also, I’d like to submit a cake recipe to you for Passover. It’s light and chocolate rich. Beat egg whites with salt until stiff but not dry, and gradually beat in the sugar. Beat egg yolks 5 minutes. Then gently fold in beaten egg whites. Mix and sift cake meal and cocoa, and fold in a little at a time. Gradually add water and fold in nuts and vanilla. Turn into ungreased round tube pan. Bake in a low oven of 325Âº degree oven for 45 minutes. Invert on cake rack and allow to cool in the pan. When the cake is cool, invert the cake right-side up. Take a knife and go around edge of the cake to loosen the cake from the sides of the pan. Lift the cake by the tube of the pan and push the cake pan from the bottom up to release it from its rim. The cake will still be on the base of the pan with tube attached. Take the knife and carefully slide the knife under the cake along the bottom of the pan. Then, slide the knife carefully around the tube itself to loosen the cake from its sides. At this point the cake has been lifted from its pan leaving the cake on the base with all the cake loosened away from the pan. Place your cake plate on top of the cake and invert. I don’t have any fish recipes, but if they do eat fish, then that’s a lot easier. 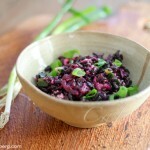 If you don’t eat kitniyot, you can make a potato dish like kugel, quiches and lots of salads. I’ve labeled all my recipes that are hametz and kitniyot-free. You’ll have to sort through them to see what’s vegan, but there should be a bunch of stuff. What a great post! I’ve been hankering for beets and have always shied away from the raw version since I have no idea how to cook them properly! 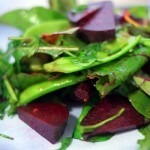 This looks like a very easy recipe for a beet novice like me to try, can’t wait!